It was Thursday, and like all mornings on Thursday, he enjoyed some breakfast. This morning it was an elaborate Crepe Souffle with Creme Sauce and a hint of Paprika with Chipotle infused raisins covered in a drizzle of Blueberry extract. After his coffee and a few donuts, he ventured into the striped garden with his famous feline, Pixel, the cat who can speak 9 languages that don't exist. The watched the birds attack the bird feeder, wore scarves, and sang the entire album Kid A from start to finish, using their mouths as the instruments. A bird joined in, and next thing they knew, Thom Yorke flew over from England and recorded it and sold it on a rare website that no one could remember the name of. He really wished he could remember the name of that website. have you considered changing your name to mEowke? There are a LOT of damn flavor profiles in that Crepe Souffle. Gordon Ramsay would say "keep it simple." @miguelito I will add it to the list of considerations. Thanks for the suggestion. It ranks just above Fozzy but slightly below The Great Destructor of the Eastern Seaboard. "Eastern Seaboard" (see bored) always makes me giggle for some reason. I remember the name of that website. But it's unpronounceable, and whenever I write it down it fades out again. And the download manager is telepathic. Chipotle infused raisins... that could ruin the rest of the day for most people. That kitteh is a beaut. What is it's name? Strike that. I should have just read the caption better. CLAME FOR CATS in the header. and let me know if you figure out the name of that website...that album sounds wicked awesome. @miguelito Upon rereading your new proposed name for me, I realize that I read it wrong. My first reading was "mEwoke." You know. Like an Ewok. And I thought you were commenting that I look like an Ewok. But I see what you were saying now. The thumbnail of this pic looks like you're licking your cat. Did you know that I also have a tuxedo cat? Because tuxedo cats are clearly superior to all others. Mine knows how to read. CLAME. @emsiizilla - that is amazing. My can can pee on stuff really well. He also can shake hands. And he stands on the heating vent, praying for the heat to come on at least 57% of the time. I feel like paprika doesn't get enough love or attention. Hence I proclaim today not only @mattyc day but paprika awareness day. also: thanks for the birthday wishes and I'd take some owl mail any day of the week. unless it's Tuesday night because I might be eating tacos. And we all know how owls get around tacos. I've got a bootleg version of that if you're interested. jus sayin. "He looks like he's in an insane asylum" said the co-worker sitting behind me. That thing you have. It is cute. @reasaurus SEE THAT THING HE HAS. IT IS CUTE. I hope you have meals similar to those you describe in your captions. P.S. Thanks for the caption! @mOtke always makes me smile. I got a tuxedo cat when I was 5. I named him Leroi (also French for "the king"...which he was in our house of course). Leroi lived to be 19 years old. He liked to read too, but once ate a picture of some food out of my 4th grade science book. 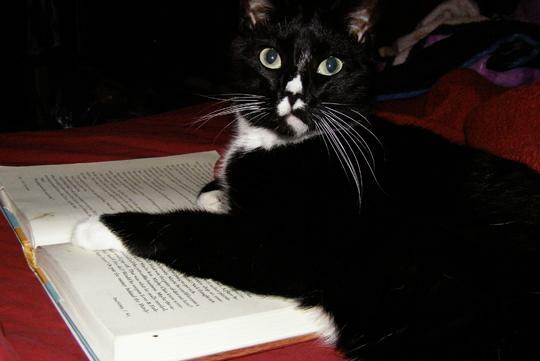 The teacher didn't believe me when I told her the cat ate my book. Leroi also knew how to use doorknobs, but alas, without opposable thumbs he just couldn't quite pull it off. maybe you and pixel can grace us with some radiohead karaoke during the throwdown. This is a great shot...are you licking you cat? i don't know why, but those pants make me glad to be alive.